Good things come in small packages, or so the saying goes. In the case of the Cambridge Audio DacMagic XS it’s certainly true. This thing is tiny. 30 x 10 x 53.5mm and 100g (3.5oz) in weight, but it’s build quality is excellent. At one end you’ll find a micro-USB input, at the other a 3.5mm analogue output. On the top just two buttons for volume control, the + and – symbols raised enough so that they are easily identifiable by touch alone. The brushed aluminium finish both looks and feels good in the hand. In the box you get a branded soft carry pouch and a short USB to Micro USB cable for connecting to your laptop or PC. In order to use this with your Android phone or tablet you’re going to need a USB OTG cable or possibly even a USB OTG-Y cable depending on your device. 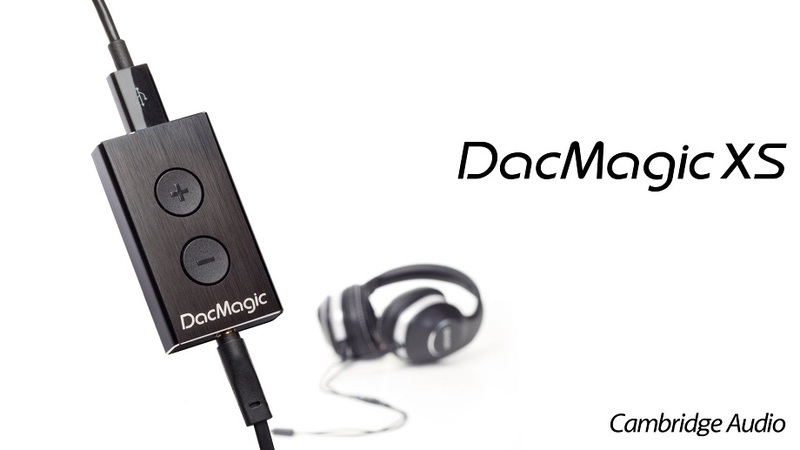 The DacMagic XS is aimed mainly at laptop users who want better sound via headphones from their machines, let’s face it, they’re not known for great sound out of the box. And I have to admit, it drastically improved the sound out of mine once I had installed the drivers. It’s an incredibly portable solution for anyone using a laptop on the go, or even at home. It also makes getting quality audio from your laptop to an analogue amplifier a breeze, simply by using a 3.5mm to RCA cable. The target audience though is definitely headphone users. Previously if I wanted to use my headphones to listen to music on my laptop I had to connect it via S/PDIF to an amplifier, using the heaphone out on that rather than the laptop itself. It meant having another appliance running and no mobility, but with the DacMagic XS I could move about freely and the leap in sound quality was no longer dependent on me sitting right beside an amplifier. 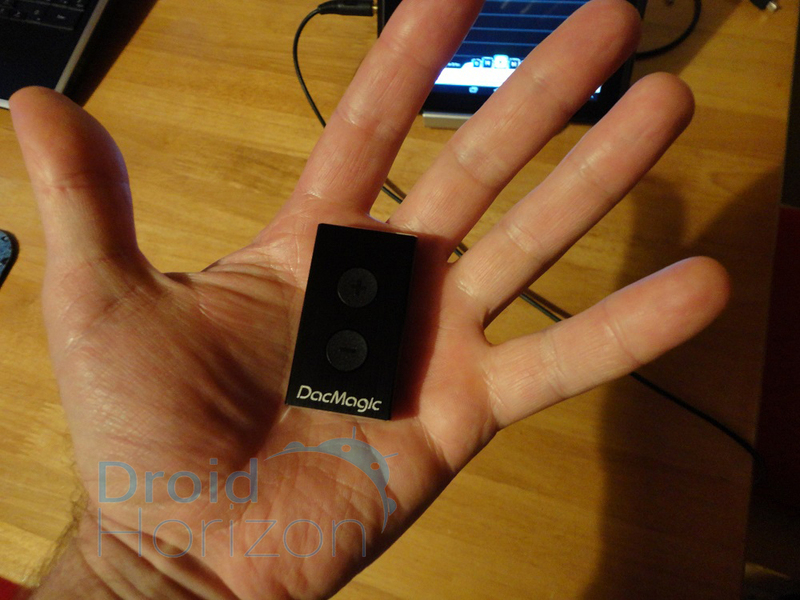 But, what I really wanted to test the DacMagic XS on was Android devices. 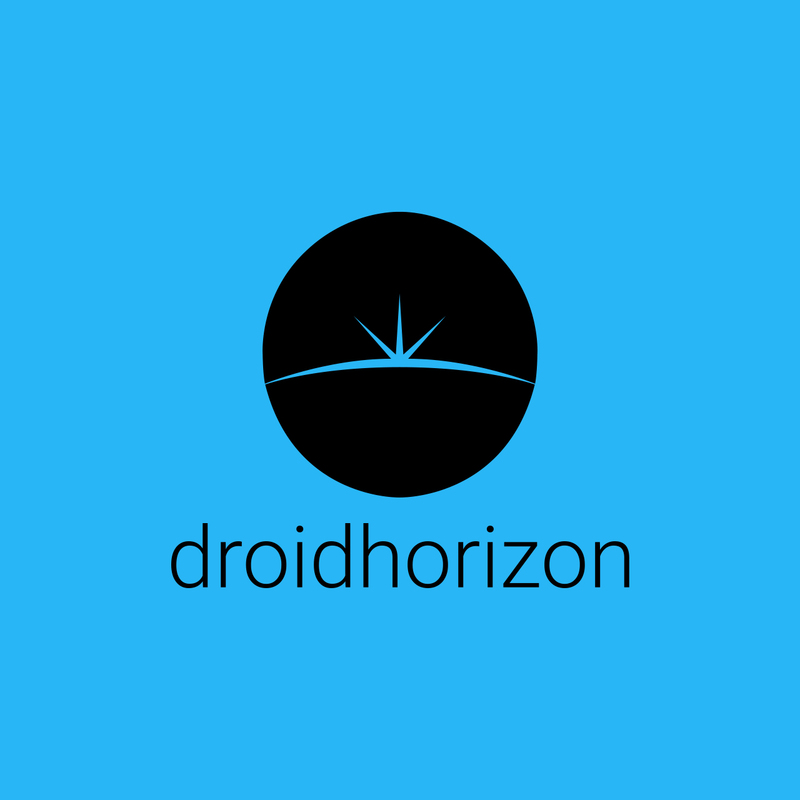 Some Android’s will work with a USB DAC simply by plug and play, but many won’t, nevertheless thanks to this app, USB Audio Player PRO there’s a chance that if your phone supports USB hosting and you own a USB OTG cable you’ll be able to reap the benefits of your external DAC, and any high resolution music you own. Using USB Audio Player Pro I tried the DacMagic XS on my Galaxy Tab 2, it works, but unfortunately required a powered USB hub, and due to the TI OMAP in the Tab 2 it wasn’t smooth sailing, the tracks had a faint repetitive crackle, and every now and again a section of the track would repeat itself, this is a known issue documented by the makers of the app, and wasn’t unexpected. Switching to the Galaxy S3 it all came together. No need for a powered hub. Nearly took my head off though! I’d connected it to the laptop/amp again at full volume in between switching from the tablet to phone, and forgotten to turn it down before setting up the S3. The DacMagic XS is loud, very loud! The inbuilt headphone amp is rated at 150mW with 53 steps in the volume control. The sound was hugely impressive, those 53 steps making it very easy to find a suitable volume level for the various genres I listened to. Clean, punchy bass with no sign of distortion, and detailed mids and highs with no shortage of power, I was hearing things in the music that I’d previously only heard using my amplifier and speakers. This little box will be a deciding factor in any future phone or tablet I consider. 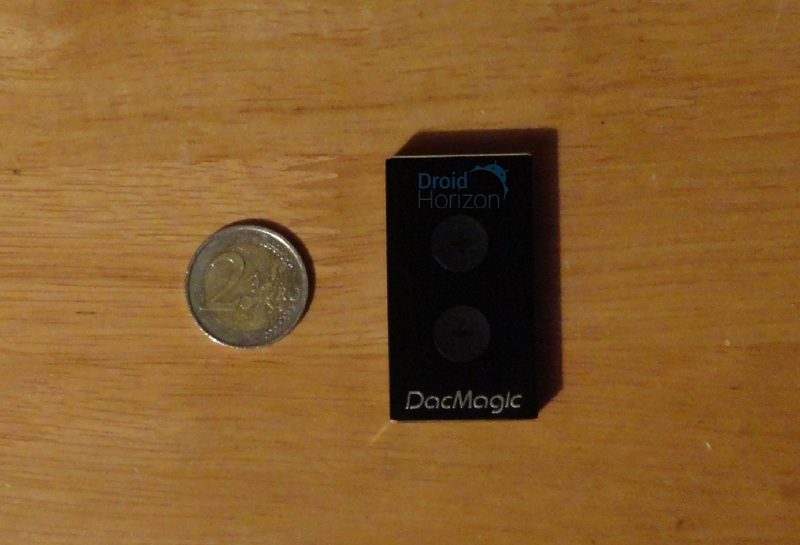 Now obviously using the DacMagic XS with your device is going to impact battery life, as it has no internal power source, but that can be relatively easily countered by using an extended battery or a USB OTG-Y cable in combination with a power pack or a even mains outlet if you are travelling on a train for example. At just under the £100 mark the Cambridge Audio DacMagic XS is an extremely portable DAC/headphone amp that sounds ridiculously good for it’s pricepoint. If you are looking for a way to improve the audio from either your phone or tablet as well as your laptop then I’d certainly recommend checking it out. The full specs are below, for those that are interested. 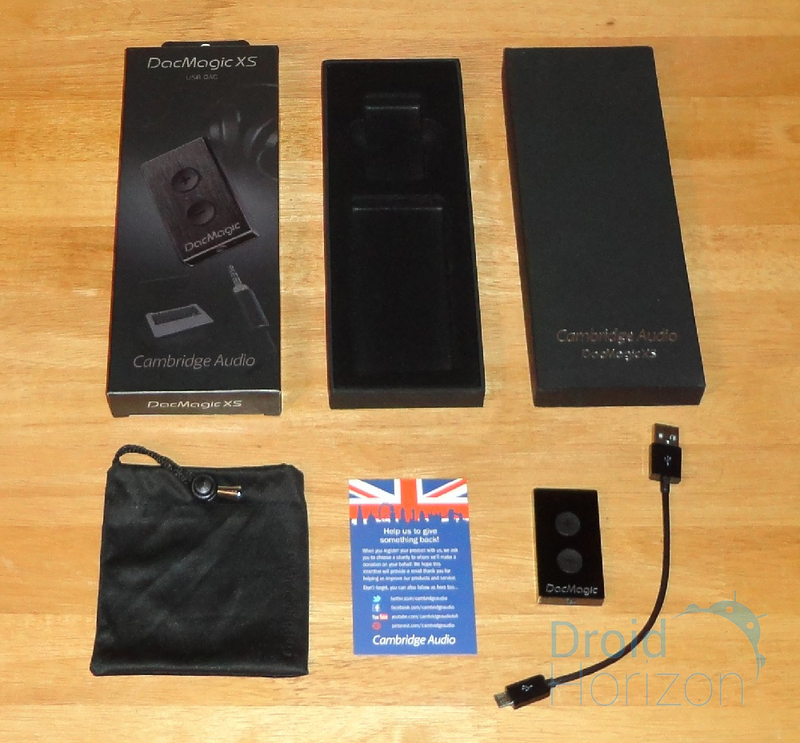 Does anyone know if the Cambridge Audio Dac Magic XS works with a Tesco Hudl? No idea Phill, don’t have one to test it on, sorry. If USB OTG is working on your Hudl, (from what I’ve read some people had issues with it), then it should work with USB Audio Player Pro, but may still need a powered hub. Only way to be 100% sure would be to find a retailer that will let you try it out.